Sixty Songs of Milarepa. Milarepa who is often referred to as Jetsun Milarepa, meaning Milarepa the Revered One, is a central figure of early Tibetan Buddhism. He was a Buddhist saint, a yogi, a sorcerer, a trickster, a wanderer, and a poet. He is both folk hero and cultural preceptor, the embodiment of the ideal in Tibetan Buddhism. Milarepa songs are an extensive collection of stories and poetry from the life of Milarepa, they are a central text of popular Tibetan Buddhism, in some ways comparable to the Bhagavad Gita in Hinduism and the New Testament within Christianity. His life stories and poetry are read devoutly today to inspire determination in meditation and spiritual practice. Milarepa is both folk hero and cultural preceptor, the embodiment of the ideal in Tibetan Buddhism. 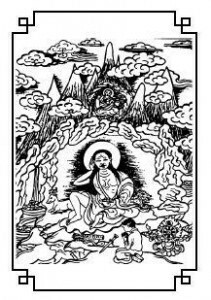 Milarepa songs are an extensive collection of stories and poetry from the life of Milarepa.